The Huawei B315s-22 is a 4G router for family use. Like its predecessor Huawei B593s-22, it allows sharing the 4G connection in WIFI with a valid SIM card from a network operator, and of course, the SIM card must has a data plan. 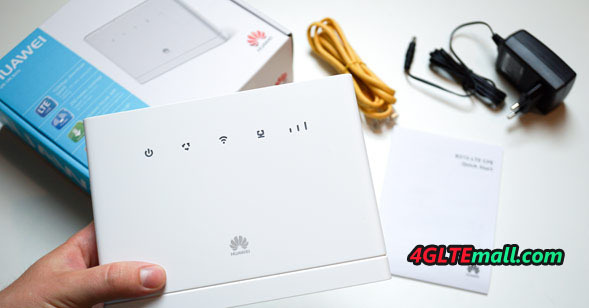 Thus, in places where ADSL is of poor quality but 4G is available, it would be necessary to replace the ADSL and use the new Huawei B315s-22 with new contract from 4G network provider. Frequency bands: LTE/UMTS/GSM (4G LTE-FDD 800/900/1800/2100/2600MHz 4G LTE-TDD 2600MHz). However, frequency 700MHz is supported on band 28. The configuration of this type of router does not pose any difficulty. It is normally enough to insert the SIM, start the router, connect to the address http://192.168.1.1 after having connected to the B315 router’s WIFI (name and wifi key available behind or below) and then launch the quick configuration in the interface (login name and password are both default as “admin”). This router is also controllable using the mobile application HUAWEI HiLink available on android or ios. User can manage the router settings from smartphones and Pads. The Huawei B315s-22 is an excellent 4G router. The main difference with the HUAWEI B593s-22 is that it has better 4G reception, it only has one RJ11 port, it does not support the SIP protocol and it does not allow the router to use only the 4G. Thus, if the 4G/LTE signal is not very powerful, it switches itself in 3G or worse in 2G. However, you can connect an external 4G/LTE antenna to change this situation. You can connect a phone using the RJ11 jack (you need a T/Rj11 adapter if you have an old handset) to make calls using the sim card number 06 or 07 (If it is not just a data card). For most cases, the Huawei B315s-22 is enough for most users with the support of LTE download speed to 150mbps and upload speed to 50mbps. But if there is LTE advanced or LTE-A pro network available, it’s also better to try the latest Huawei E525, Huawei E5186 or Huawei B618 Routers. We suppose one of them would definitely meet your demand for home or office wireless network. The Huawei B593 is a fashionable 4G ​​router. 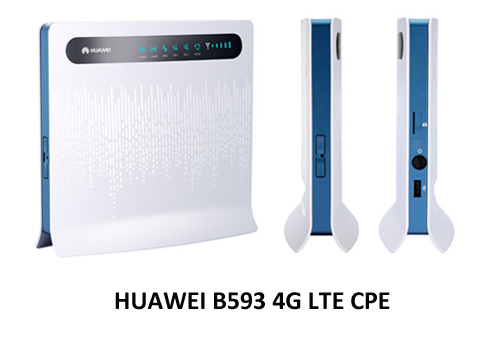 As the first generation 4G LTE Wireless router, Huawei B593 has evolved to many variants models to support various LTE frequency bands deployed worldwide. Huawei B593s-22 is the upgraded model from the B593 LTE CPE. First on the French market, it was introduced by Bouygues Telecom which proposed it before its replacement the Huawei E5186s-22a appears for professionals. Currently, many users who sought to achieve high-speed access at home adopted Huawei B593s-22. It is an excellent modem which allows high speed internet access and stable connection, especially to work at home. The configuration is simple. Insert the sim card, plug in the router and turn it on. If the PIN code of the SIM card is not 0000, you obviously need to set it in the web interface. For this, connect an RJ45 cable to the router and connect it to your PC. Using an Internet browser, go to address 192.168.1.1 or http: //homerouter.cpe. You normally access the interface of your router. The username and password are marked on the back of the device (admin / admin). Once logged in, the interface asks you to change the password. Then go to the Internet (top menu) and then to PIN Management (left menu). Enter the PIN in the PIN and confirm. Then go back to Home / Quick Setup to quickly configure your modem. Consider roaming, especially with alternative operators. Particularly well done, this Huawei B593s-22 4G LTE router does not require extensive knowledge for its installation. Not using the latest technologies, it is compatible with almost all the LTE operators in Europe ( except the new 700Mhz frequency used by free, check if the antenna close to you is not transmitting on this frequency) and will allow you to obtain a fast and reliable connection. Cheaper than its successor the Huawei E5186s-22a, it is a really budget wireless LTE router for small group users in office or at home. There have been rumors and speculation for long time that Vodafone and Telekom will be launching the next generation LTE router in the coming months. From April, Vodafone introduces new LTE Router B3000, the successor to the B2000. On the back label of the Vodafone B3000, it indicates that this is another new Huawei router. It’s from the factory model Huawei B593s-22. The internal LTE modem (of Hisilicon) even supports LTE category 4 (Cat4). Thus stationary data transfer rates of up to 150 Mbit per second can be achieved. However, due to the network coverage, LTE Cat4 is not available in all the cities. It’s now only available in some specific center cities which requires large data transmission. Probably later this year, Vodafone will expand coverage of all cities with CAT4 that designate at least 100,000 inhabitants. Otherwise, there are few significant differences compared to the previous models. The B3000 back has 4 LAN ports and two RJ11 connectors for telephone via VOIP. In addition, a USB port is available for printer or host sharing and two SMA sockets for special LTE antennas. The router is DLNA enabled. So how about the 4G compatibility? At this point, there are fortunately no complaints. All popular bands are supported in Europe, including LTE 800, 1800 , 2100 and 2600MHz. Even LTE on 900 MHz can be supported by the B3000 theoretically. Per the original factory model Huawei B593s-22, it can also support the 4G TD-LTE frequency 2600MHz. Vodafone plans, which claims to introduce the B3000 in April. The surcharge for the business customer data tariffs is unique around 10 €. For private customers pay about 50 euros once. 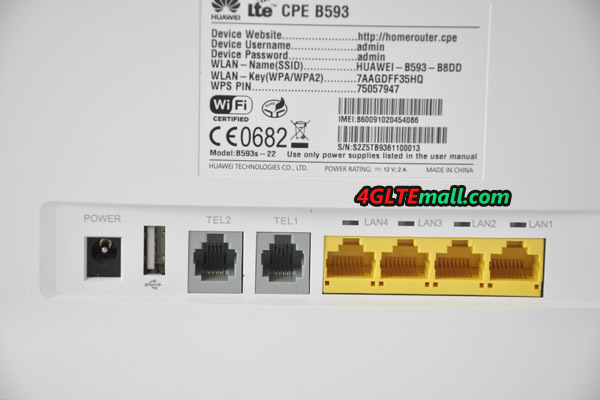 The B3000 router is already available as Huawei B593s-22 without a contract in the store 4gltemall.com . Tip: Huawei B593s-22 could fully replace Vodafone B3000 because it has the full functions as designed and no customization from operator. The Vodafone B3000 LTE Router is available in stores now. The device is the successor to the Vodafone B2000 , which came on the market in spring 2012. The highlight of B3000 is the support for LTE with up to 150 MBit/s in the downlink and 50 Mbit/s in the uplink (LTE Category 4), in addition, the router can be used for calls via VoIP. The design is largely identical to its predecessor, and also the target group has not changed: Vodafone offers the B3000 primarily business customers. On the back and on the sides of Vodafone B3000, we can find all sorts of connections. 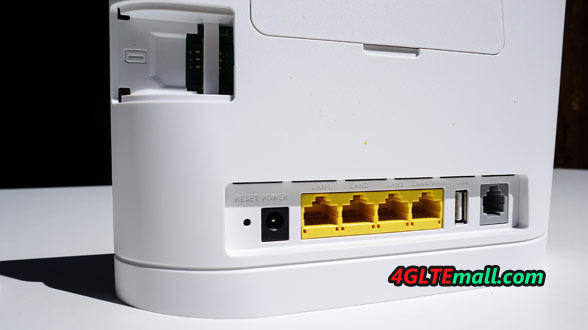 The four LAN ports connect to network-enabled devices and two RJ11 connectors allow the connection of analog phones. Furthermore, two USB connections for the integration of a printer or USB storage device available and under a cover there are two connectors for external antennas (type: SMA). For example, the LTE reception quality can be improved by the LTE MIMO antenna . On the front, various LEDs indicate the operating status. The user can see at a glance, for example, the signal strength and network technology here. 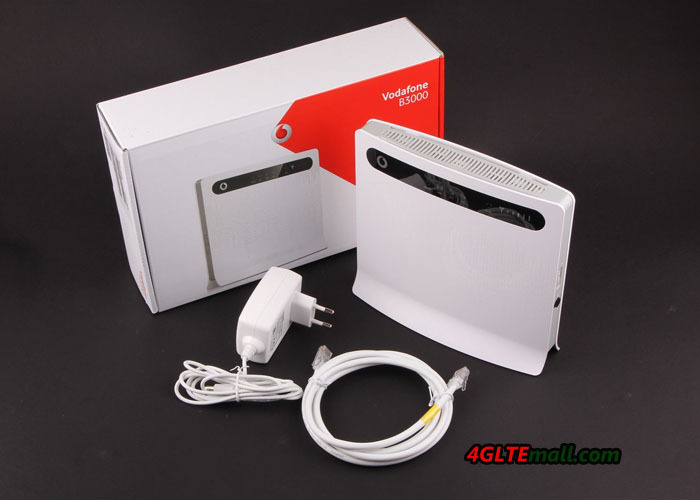 The Vodafone B3000 LTE router is manufactured by Huawei and it carries on the model number of Huawei B593s-22. Besides LTE Category 4, the modem allows UMTS including DC-HSPA+ (up to 42.2 Mbit/s) and of course GSM/EDGE. The supported frequency bands include the 800 MHz and 2600 MHz for LTE used by Vodafone, if there are more bands are supported, it is not clear from the documents at our disposal. But we are sure that the original model Huawei B593S-22 would support the LTE FDD 800/900/1800/2100/2600MHz & TDD 2600MHz. The WLAN module operates at 2.4 GHz and supports up to 32 simultaneously connected Wi-Fi devices. According to the manufacturer Huawei, the power consumption of Vodafone B3000 is under 12 watts. According to Vodafone, the B3000 LTE Router available until early April in the Vodafone online shop as well as in retail stores(www.4gltemall.com for unlocked version). However, some traders already now offer the B3000 with prices. But it’s better to get unlocked one before purchasing, the unlocked one would use with any other operators besides Vodafone. Followed Huawei E5170 Speedbox, a new LTE Router Huawei B880 offered by A1 Austria and is available now. 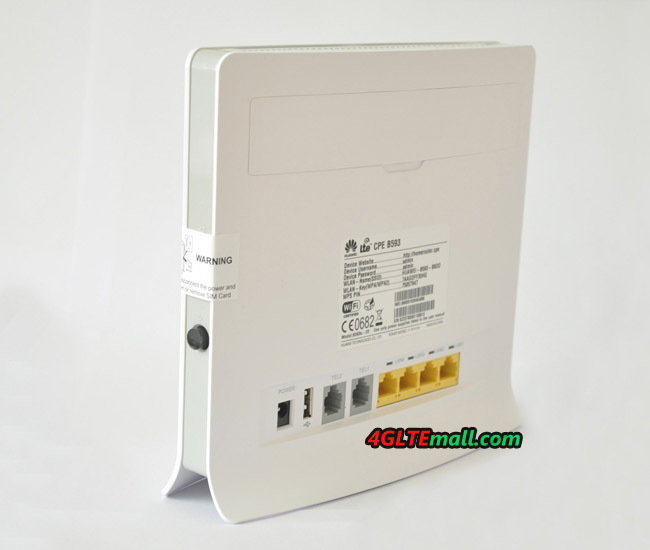 Huawei B880 is a LTE Category 4 WiFi Router and support maximum of 150 Mbit/s downlink and 50 Mbit/s in the uplink. A1 offers these speeds currently in major cities. The router is technically quite similar to the Huawei B593s-22, which does not have a LAN connection and it’s regarded as a older version. The biggest criticism of Huawei B593 also unfortunately exists in Huawei B880: either the LAN terminal or the wireless module will be capable of the full speed of 150 Mbit/s when transfer to a terminal. So Huawei continues only on Wi-Fi 802.11b/g/n and the LAN port can operate with a maximum of 100 Mbit/s. On the back of the Huawei B880, we can found there is a RJ11 telephone connector next to the LAN port, so you can use the B880 as a full telephone system. Furthermore, a WAN connection is available; here you can connect the router as needed without mobile to the internet. A USB port also allows the use of a printer or USB storage device on the network. Like many other routers, the Huawei B880 has two SMA connectors for external antennas. 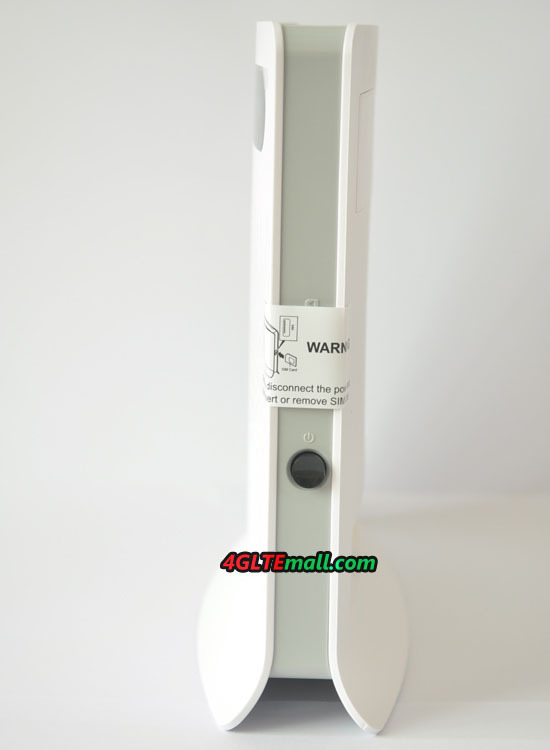 The 4G External antenna for Huawei B880 is available on 4GLTEMall.com , and there are 35 dBi, which will help users get much better signal strength and network connection. The chipset is manufactured by Huawei and belongs to subsidiary HiSilicon series. This chipset can be found in various modems, such as the Huawei B593u-12 (Telekom Speedbox LTE II ). By supporting LTE Category 4, and associated downlink speeds of up to 150 Mbit/s, Huawei B880 could be a top 4G wireless router now. Faster devices are expected until the second half of 2014. In addition to LTE, GSM and UMTS network modes are aslo supported, in the UMTS network via DC-HSPA+, the peak link speed could reach up to 42.2 Mbit/s. Here now there is unlocked Huawei B880 for sale at 4gltemall.com and if you want the 4G Antenna for Huawei B880, it’s also available. The Unlocked Huawei B880 would work with all the 4G operators in Europe, and most operators in Asia. If LTE signal is already available in your area and you want to maximize the fast speed for 150Mbps, the Huawei B593 4G Router might be the best device to deploy this. We had the LTE CPE B593 for about a few months and have tested it with Vodafone and Telekom 4G LTE networks (more often with Vodafone), not matter it has weak or no LTE signal in the house, condo and the office). The model number is B593s-22. 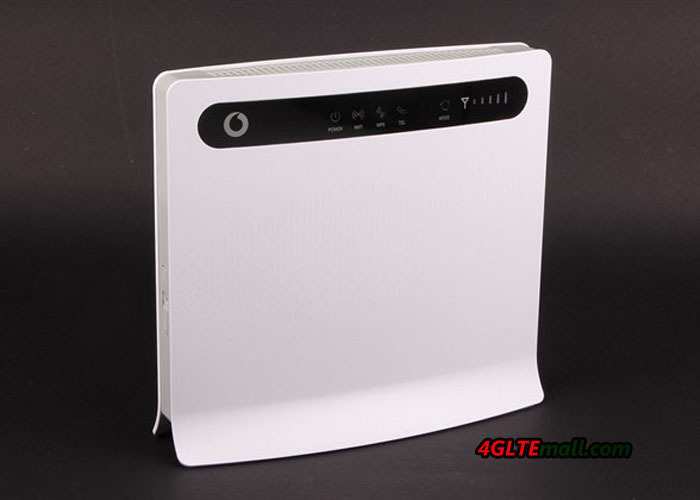 Just like HUAWEI E5172, it’s a 4G LTE Category 4 WiFi Router. The device B593 is with HUAWEI logo and no operator’s logo can be found. So it is unlocked, we’re able to use it with local carriers. 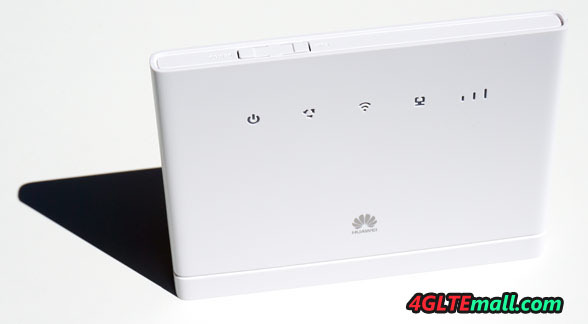 We’ve also tried the 3G/HSPA+ WiFi router (Huawei B683) before and have been well satisfied with it. 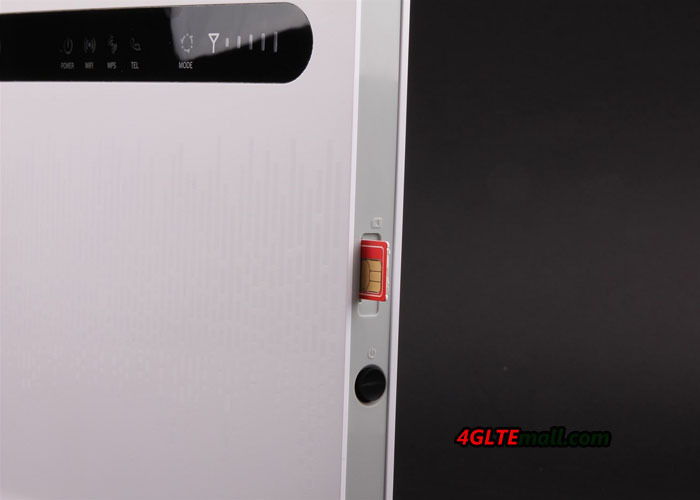 Now the 4G LTE networks provide much faster connection speed and surfing experience, it’s time to use a 4G device to enjoy the great speed. We used the Vodafone Prepaid LTE and Telekom prepaid SIM card, they both worked fine on Huawei B593 4G LTE Router. The SIM card slot is at the bode side of Huawei B593, below the SIM card slot, it’s the power button. On the other side of the router, there are two buttons for WPS and Reset. WPS is to protect the WiFi security and Reset is help use to reset the settings to factory default. Aside from the 4 LAN ports at the back, there’s also a USB 2.0 port so you can attached a HDD or flash drive for access to network storage. And there are two analog telephone ports beside the LAN ports. User can connect two telephones to this device. For better signal strength, there are two plugs for external antennas to boost the signal in HUAWEI B593. If there’s no LTE in the area, LTE CPE B593 will switch to HSPA+/HSPA/3G automatically and work on the best networks available. We went to test out the connection via Speedtest.net and got pretty good results. 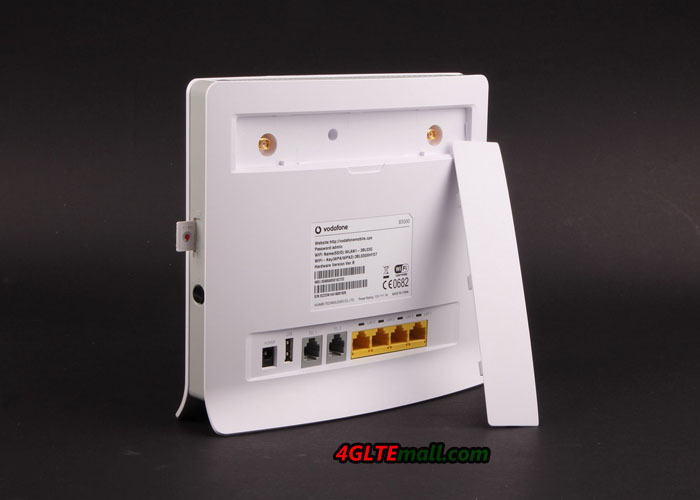 The device is available on 4gltemall.com but if you also need the external 4G antenna, it is sold separately for on 4gltemall.com with good price. To buy them together, you will get some discount.